Best Battery Operated Blender - Portable Blender on The Go! If you are looking for the best battery operated blender, then you have come to the right place. In this article, you will not only find battery operated blenders, but also, alternatives you can go for in the event that you do not fancy the battery type. Chances are that you live in a place where electricity is not an option or you just want to be free from the socket or take your blender to a camping trip. Regardless of the reason, the blenders in this article will give you just that. Not only are some of these so powerful that you will not even miss the one at home, but they are also very strong making them suitable to take on the road. If you do not like the idea of charging batteries, you can go for one running on gas. If that will also not work for you, then perhaps you will like one powered by muscle. So without wasting any more time, let’s get started and see some of the best portable blenders you can get. The GSI outdoors Vortex Hand Blender is among the blenders that will give you the freedom of working from anywhere. As a matter of fact, it would be a great contender for the best portable blender title if we were to have one. Whether you care out camping or you are in a situation where electricity is not an option, you will love what the GSI Outdoors Vortex Hand Blender has to offer you. It comes with a hand crank that you have to use when you want to blend your foods. You might think it is a lot of work, but it really is not. There are two speeds you can choose from. Both these work just fine and you should have no problems at all. With a 1.5 liter pitcher, you can be sure you will be able to make enough juice for yourself or for the whole family. To make it easy to use, it comes with a table clamp lock that keeps it firmly on the table. This will, without a doubt, make a great travel companion enabling you to still stay healthy regardless of where you are. And to prove that it is a road warrior, it is really strong and you can tell that it will be your best friend for years. The base parks into the pitcher making it a true road warrior. The GSI Outdoors Vortex Hand Blender is definitely worth a look. For those looking for the best portable blender, you will glad to know that you have a lot of options. One of them is the Cuisinart CSB-78 Smart Stick. With a cordless design, there is no need to be tied to the socket anymore. You can sit wherever you think is appropriate and blend as much as you want. It will last for about 20 minutes on a single charge. The addition of a thumb activated on/off power button is a brilliant one and makes using this blender really easy. It has a stainless steel blending shaft which adds a nice touch to its mostly black body. All in all, it is an excellent design that saves a lot of space in your kitchen. But that should not fool you into thinking this machine is small. As a matter of fact, it will feel big and heavy to hold especially in small hands. Getting it in a pitcher, bowl or pot is easy. And without taking any of its glory, you will not be let down with this blender. It does excel with many foods and the results are acceptable. You will not find many large chunks as is the case with many portable blenders. To top it all up, the Cuisinart CSB-78 is very affordable. The Margaritaville DM900 is probably the best battery operated blender money can buy. Coming with an 18-volt Ni-Cd battery that is rechargeable, this blender gives you the freedom of blending foods anywhere the urge strikes. This is a great feature if you are always on the road as it will let you live a healthier life while away from home. Since we expect tip-top performance from a blender as pricey as this one, the Margaritaville DM900 does not disappoint. It pulverizes whatever food you put in it effortlessly. With the addition of preprogrammed settings, the job can never get any easier. And to prove that it is a machine built for the road, you will love how rugged it is. This can also be said for the 36-ounce blending jar. Cleaning this machine is as easy you can imagine that you should not even worry about it. I would have loved to see the unit plug into an outlet when at home, but still, not such a big problem – I am sure anyone can live with it. An addition to this, it is a little loud – but then, all blenders are, so no complaints anyway. All in all, the Margaritaville DM900 is a great battery operated blender that you will be happy with. Choice is everything when it comes to buying kitchen appliances. And for those who do not believe in a battery operated blender, perhaps you might fancy getting a gas-powered one, like the Tailgator Gas-Powered blender. You will definitely love it for having a lot of power and the flexibility of allowing you to work from anywhere. Its 2.25HP motor is powerful enough to crush just about any food. Unlike other gas-powered blenders, you will have no issues getting this one started. Just put in fill it up and you are good to go – it does not matter whether you are at camp or in a boat. The Tailgator Gas-Powered blender is so easy to operate. It comes with a manual that should be enough to get you running at full speed in a matter of minutes. As a warning, you should be ready for the little gasoline like taste. But it is not bad and you will get used to it in a matter of days. If you are someone who for some reason cannot use an electric blender, a gas powered one is something you should seriously consider. A party does not mean you should only be limited to alcoholic drinks. As a matter of fact, you can have healthy drinks too so long as you have the right tools like the Waring TG15. It is very portable and does not need to be tied to an outlet. All you need is a car cigarette lighter and you are ready to get the party started – the cigarette lighter will provide all the power. But as you might have imagined, this is not very powerful. The Waring TG15 operates at a single speed which should not be a problem considering that you are not even at home. And as a machine meant to be used on the road, this blender is very solid. You can have it in the back of your car, bike or even boat. The jar is made from plastic, but you can tell that it will take a determined force to break. The blender can make 6 cups of juice. But since we are not talking about Vitamix power here, you should shy away from loading this baby with a lot of food. Otherwise, you will find it choking all the way. But it does really well when it is not overloaded. For those where battery, gas or electricity are not options but you have a car, then this is the blender you should include on your shortlist. Blenders come in many shapes and sizes and they operate differently. Because of this, there is no one way to use a blender. Fortunately, they all employ the same principals. So to some extent, it is still possible to have a guide showing how to use this machine no matter how it is powered or how many buttons it has. Here are the steps to follow when trying to use a blender. If it is new, you will need to clean your blender before using it. It is very easy as you just need some water and soap. If it is dishwasher safe, you can use that as well. But you should never think of getting the base in water as that will spell the end of it. Usually, almost all blenders will come with some form of a recipe book. If they do not, you might be referred to the manufacturers website to have the same. But if you want even more, you can search on the internet and you will find lots of them. However, I would still recommend you buy a cheap ebook online – it is worth the investment. Once you are done preparing the ingredients, pour them into the jar. As a rule of thumb, it is always a good idea to add some water. Make sure to not overfill the jar as that might create problems. Close the lid and start the machine. Refer to your manual if you are not sure about how to do this. But normally, you will see Start, Pulse or On button. After a few minutes, your ingredients will be ready for drinking. If you find it is not of a consistency you wanted, simply run it again. But most of the times, it will be ready on the first run. Since the juice might come out a little warm in some blenders, you might need to put it in a refrigerator before drinking. While you can clean your blender whenever you feel like, it is a good idea to do it soon after use. It is easy to remove all the residual before it has dried. Again, simply use soap and some water. If you want to make it easier, put it in a dishwasher if it is dishwasher safe. In this article, you saw some of the best battery operated blenders. If you did not like them, however, there are other alternatives that will achieve the same portability that comes with battery operated blenders. They are all good ones and you will definitely be happy with any of them so long as your are clear of your needs. Be sure to read the reviews thoroughly as some are only good for making juice for a single person etc. Almost all blenders here will have an included manual. Read this carefully before you even attempt to use your new blender. Needless to say, but try to follow all the instructions as stated in the manual. 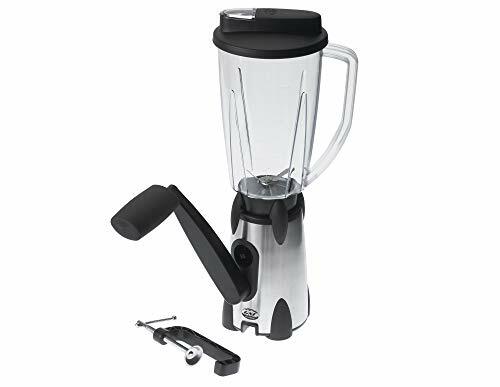 If, for example, there is maximum volume a blender can take at a time, be sure to adhere to this at all times as doing contrary might be a recipe for disaster. Since you will be moving a lot with your blender, avoid dropping it at all cost. Some of these have carry bags which can be bought separately – I will recommend that you invest in one of these.